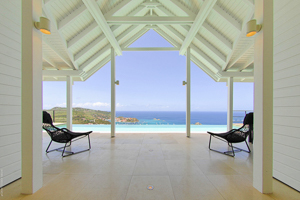 Villa UJV 157, or "The View" is a 4 bedroom villa located high up on the Colombier hillside, St Barts with one of the most spectacular views the island has to offer. The panoramic view from the villa encompasses the islands of Nevis, St Kitts, St Eustatius, St Martin and the quaint harbor of Gustavia. This villa enjoys year round sunsets. "Chic, refined and elegant" sum up the rich interior décor of this architectural masterpiece. All the rooms have the same Argentinian designer furniture, which is a unique collection of leather and parchment designs in natural hues and of exceptional quality. Stone steps lead down to the villa and the only sound to be heard is a contemporary stone waterfall that trickles gently, giving a soothing ambiance. From here, you are completely mesmerized by the captivating view. The living area is very spacious. Looking out from this room, it seems that the pool is overflowing into the ocean, giving the impression that the pool stretches to the horizon where the sea meets the sky. The kitchen is a gourmet delight with every convenience imaginable. The kitchen leads directly to the inside dining area, which in turn leads to the outside dining area. Two of the bedrooms are located on this same level and are similar in size. Their ensuite bathrooms are very large and have double sinks and spacious shower areas; they even have the same incredible view! On a lower level, after meandering through the gardens is the third master suite, located in a separate cottage. Totally private from the main villa (and the rest of the world), guests can enjoy the heated Jacuzzi located on the bungalow's terrace or a quiet drink from the bar on the dining table. Inside the bungalow there is a sitting area, an office, dressing room and an enormous bathroom. Below the main house is the 4th bedroom with its own stairway and deck. The air-conditioned fitness room is near the 4th bedroom. During the Thanksgiving period the villa rents only at the 4-bedroom rate.